This weekend Ri and I did our first show, on our home property in Bucks County. Sometimes home turf can be a disadvantage, but while Ri at times seemed afraid (I could feel his heart beating hard) it was mostly because of the sponsor signs posted here and there. The warmup in the indoor wasn't great, but when we moved to the dressage ring outside Riley was super. We had nice, happy tests that weren't very organized. He lost his shoe the Friday prior to the show. I scratched, but the farrier showed up Saturday and suddenly Ri was ready to go. I had never done the tests (granted they were intro tests). I had not yet ridden Riley outside this year. A few weeks earlier he had run out of the outdoor ring with the trainer, bucking as he ran across the adjacent field. He hadn't been ridden outside since then. We got a 64% and 65% from a pretty generous judge, and ended up with a blue and red ribbon (Riley devoured the blue one in short order). 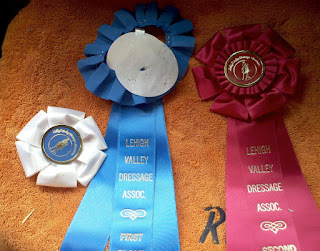 LOL Way to be proud of your ribbon, Riley! Nice going!! Keep that slightly wounded blue ribbon in a safe place. Years from now, when Riley is doing Grand Prix, you can pull it out and have a good laugh along with some wonderful memories. Congrats!! Those are good scores for, essentially, your first time out. what great news...you've both worked very hard congrats! Maybe the blue ones taste better? Oh that is hilarious about Riley's ribbons!! Once my horse stepped on his ribbon and ripped it during the victory gallop.. I guess he thought we should have won!